Amrita University M.Tech Admission 2019 - Amrita Vishwa Vidyapeetham, Kochi, Kerala invites applications from candidates for Admission into 2 years M.Tech Programs with 4 Semesters Offered at Amrita Schools of Engineering - Amritapuri, Bengaluru and Coimbatore for the session 2019-21. Amrita University has published official notification on website of Amrita University for admission into 2 years M.Tech Program With 4 Semesters for the academic year 2019-21. Master of Technologies (M.Tech); M.Tech (Part Time) offered at Amrita Schools of Engineering - Amritapuri, Bengaluru, Coimbatore. Bachelor’s degree in Engineering/Technology (4 years after 10+2 or 3 years after BSc. /Diploma in Engineering/Technology) - Currently in the final year or already completed; M. Sc./ MCA or equivalent master’s degree in any branch of Science/Mathematics/Statistics / Computer Applications or equivalent. Professional Society Examinations (equivalent to BE/B.Tech/B.Arch.) recognised by MHRD/UPSC/AICTE (e.g., AMIE by Institution of Engineers-India, AMICE by the Institute of Civil Engineers-India). Applicants should have scored a minimum of 60% in the qualifying degree. 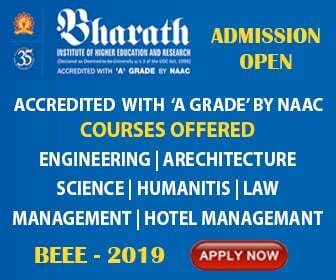 GATE qualified applicants can choose the paper appropriate to the discipline of their qualifying degree if Amrita Graduate Entrance Test (AGET) exam is available in such a discipline. For example, if the applicant has completed B.Tech /BE in CSE, attended GATE exam in Electronics & Communication And is planning to join Robotics & Automation at Amrita, he/she can choose CSE as the exam and opt for Robotics & Automation. In this case, applicant can opt for any specialisation having CSE as the eligibility. Those who doesn’t belong to the above categories are admitted based on the rank scored in Amrita Graduate Entrance Test 2019 to be held in the last week of May. Preference for applicants who did good projects in their graduation /master’s program. Applicants can choose any examination as listed below keeping in mind their eligibility for the specialisation preferred. Computer Science, Civil, Electronics, Electrical, Mechanical, Aerospace, Physics, Chemistry, Mathematics, Instrumentation. Application submission is completely online. Prospective applicants shall register for the Amrita Graduate Entrance Test for M.Tech. through the online portal link published in the website www.amrita.edu/mtech. The application fee is INR 960/- which is NEITHER refundable NOR transferable. Payment has to be made online through net banking or debit/credit cards. As per the prevailing norms, additional online transaction charges or bank charges may be applicable. Payment - Make the payment online. If you are making payment by demand draft, download the filled application form and send it to the admission coordinator along with the demand draft. Payment Details: Application Fee can be paid online via Net banking/Debit Card or Credit Card. If you wish to pay the fee by way of demand draft, download the application as PDF after the second step. Send the printed application along with the demand draft* to the campus of your choice. *demand draft shall be drawn in favour of “Amrita School of Engineering” payable at:Coimbatore for Coimbatore Campus, Kollam for Amritapuri Campus. Bengaluru for Bengaluru Campus: The amount on DD will be Rs.960/-. Send the filled application to the respective campus of your choice. Candidate should indicate the name behind the demand draft.